Fire crews work to clear drains in Tahoe Keys. Power has been restored to more than 2,000 customers in South Lake Tahoe. 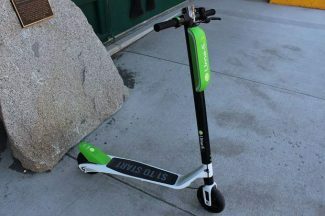 Liberty Utilities was able to located the cause of the outage, which impacted approximately 2,207 customers in the eastern part of the city, according to Kathy Carter, spokesperson for Liberty. A tree had fallen on a power line near Needle Peak Road and Wildwood Avenue. Power was restored as of 1:30 p.m. — about one hour after the outage was initially reported. A powerful winter storm packing winds gusting in excess of 90 mph along the Sierra’s eastern front has left more than 12,000 northern Nevada homes without power from north of Reno to south of Carson City. NV Energy reports that more than 7,000 of the power outages are in Douglas County near Minden and Gardnerville south of Carson City. About 3,000 are in the Reno area and about 1,000 in rural Lyon County east of Reno. The National Weather Service says a 92 mph wind gust was recorded Thursday morning southwest of Reno. The dangerous winds downed power lines near Minden, toppled two semi-trailer trucks on U.S. Highway 395 south of the California-Nevada line and blew over at least one big rig at the Hallelujah Junction on California Highway 70 north of Reno and east of Portola, California. More than 2,000 liberty utility customers in South Lake Tahoe are without power as a combination of wind and rain continue to batter the region. The outage, which is affecting approximately 2,207, is mostly in the area around the stateline, according to Kathy Carter, spokesperson for Liberty. Affected streets include Ski Run Boulevard, Crest Road, Glen Road, Primrose Road, Forest Avenue and Terrace Drive. 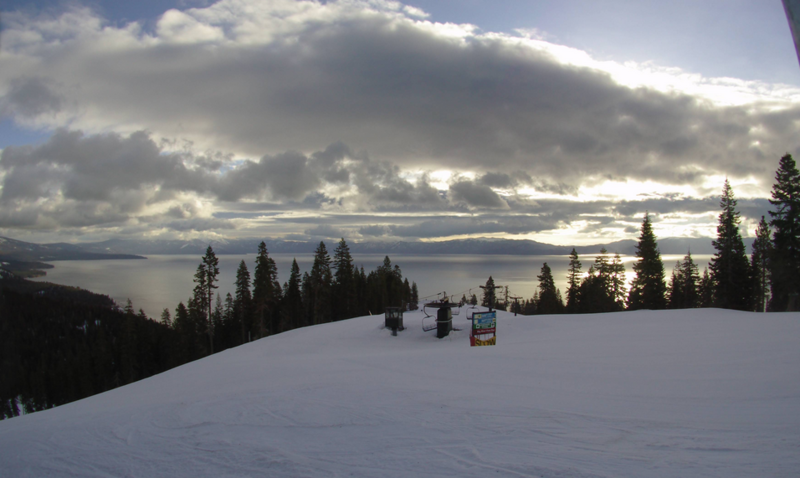 Heavenly Mountain Resort originally reported the outage around 12:30 p.m. Crews are out patrolling the lines, but they have yet to identify the cause of the outage. There is no estimated time for restoration. 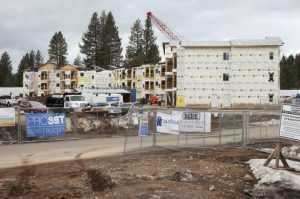 TRUCKEE, Calif. — February’s wet and wild start will continue Thursday and into the weekend, with flood warnings and winter storm warnings both on tap. According to the National Weather Service in Reno, a flood warning is in effect from 6:45 a.m. Thursday through 9:15 a.m. Saturday for lower elevation areas in Placer, Nevada, Washoe and El Dorado counties, as well as other counties. 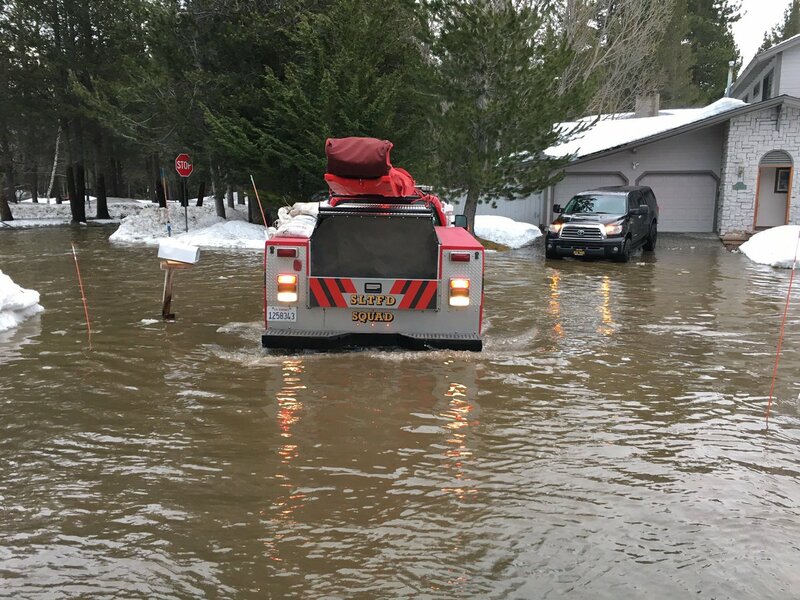 According to the weather service, while minor flooding is likely to continue at certain parts across the Tahoe-Truckee region, the larger threats for flooding are in the Sierra Foothills and Washoe and Carson valleys, among other lower-elevation areas. Aside from flooding, mudslides are also possible, especially for mountain roads and burn scars. 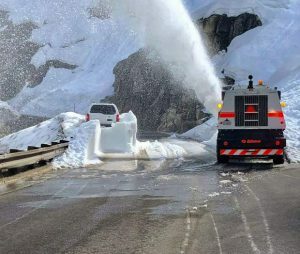 Slides have led to the closure of both Interstate 80 east of Truckee near the Nevada state line overnight Wednesday and U.S. Highway 50 near South Lake Tahoe Wednesday afternoon, according to authorities. Further, flooding forced officials to close the Mt. Rose Highway on Wednesday at Tahoe Meadows due to unsafe conditions for motorists. Sandbags are available for residents throughout the Tahoe-Truckee region; click here to check on locations near you. Specifically for Tahoe-Truckee, a flood watch (which is less severe than a warning) is in effect from 10 a.m. Thursday to 4 a.m. Friday. Meanwhile, NWS has issued a winter storm warning for the Tahoe-Truckee region from 10 a.m. Thursday through 1 a.m. Saturday. 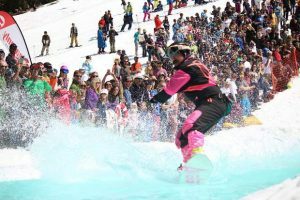 Snow levels are forecast to be at 8,000 to 8,500 feet Thursday before falling to 6,000 to 6,500 feet by Friday afternoon. In all, 1 to 2 feet of snow above 8,000 feet is possible by Friday night, with up to 3 feet at the Sierra crest. Six to 12 inches of snow is possible between 7,000 and 8,000 feet, with the chance for 2 to 5 inches of snow at lake level — after rain turns to snow Friday. Further, NWS forecasts wind gusts at lake level of 60 to 70 mph (and possible Lake Tahoe wave heights of 3 to 7 feet), and up to 150 mph or more across Sierra ridges. Stay tuned to https://www.chp.ca.gov/traffic and http://nvroads.com/ to stay up to date with travel conditions.